1Inserm, UMR1068, CRCM, Marseille, F-13009, France; 2Institut Paoli-Calmettes, Marseille, F-13009, France; 3Aix-Marseille Université, F-13284, Marseille, France; 4CNRS, UMR7258, CRCM, Marseille, F-13009, France; 5 Molecular Simulation Engineering (MOSE) Laboratory, DEA, University of Trieste, 34127 Trieste, Italy ; 6National Interuniversity Consortium for Material Science and Technology (INSTM), Research Unit MOSE-DEA, University of Trieste, Italy; 7Unit of Immunology Microbiology Environmental and Carcinogenesis (IMEC), Science Faculty of Bizerte, University of Carthage, Bizerte – Tunisia; 8Aix-Marseille Université, CNRS, Centre Interdisciplinaire de Nanoscience de Marseille, UMR 7325, 163, avenue de Luminy, 13288 Marseille, France. The actual strategy to improve current therapies in advanced prostate cancer involves targeting genes activated by androgen withdrawal, either to delay or prevent the emergence of the castration-refractory phenotype. However, these genes are often implicated in several physiological processes, and long-term inhibition of survival proteins might be accompanied with cytotoxic effects. To avoid this problem, an alternative therapeutic strategy relies on the identification and use of compounds that disrupt specific protein-protein interactions involved in androgen withdrawal. Specifically, the interaction of the chaperone protein Hsp27 with the eukaryotic translational initiation factor eIF4E leads to the protection of protein synthesis initiation process and enhances cell survival during cell stress induced by castration or chemotherapy. Thus, in this work we aimed at i) identifying the interaction site of the Hsp27/eIF4E complex and ii) interfere with the relevant protein/protein association mechanism involved in castration-resistant progression of prostate cancer. 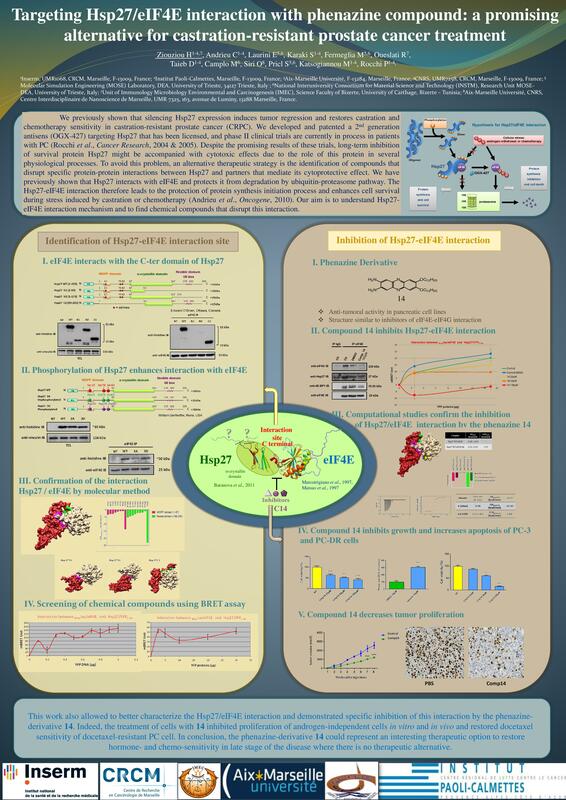 By a combination of experimental and modeling techniques, we proved that eIF4E interacts with the C-terminal part of Hsp27, preferentially when Hsp27 is phosphorylated. We also observed that the loss of this interaction increased cell chemo-and hormone-sensitivity. In order to find a potential inhibitor of Hsp27/eIF4E interaction, BRET assays in combination with molecular simulations identified the phenazine derivative 14 as the compound able to efficiently interfere with this protein/protein interaction, thereby inhibiting cell viability and increasing cell death in chemo- and castration-resistant prostate cancer models in vitro and in vivo.